October 23rd marked Diwali (or Deepavali)- the Hindu Festival of lights. Diwali is a lunar holiday, celebrated on the darkest new moon night on the calendar. Celebrations here included firecrackers and lots of sweets. Diwali is a public holiday so the local schools had the day off. Jack and I did not have the day off, but were able to celebrate through work. 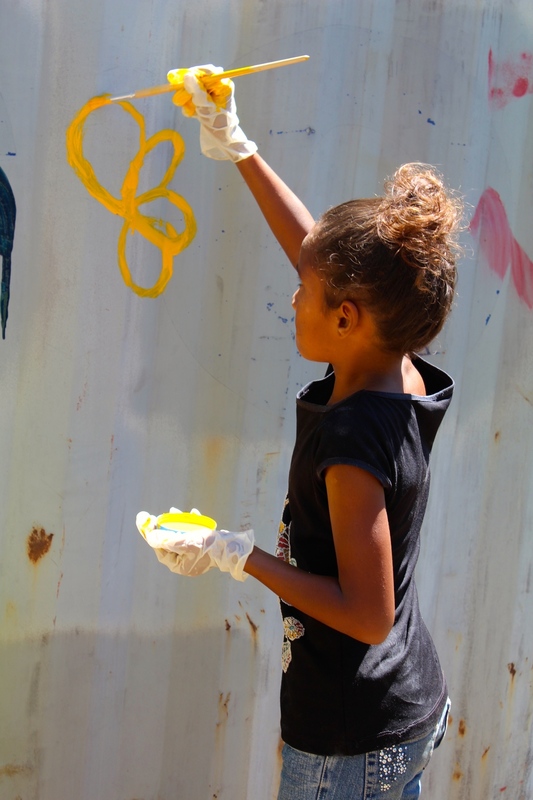 We had 16 kids join in painting one of the containers at the resort. 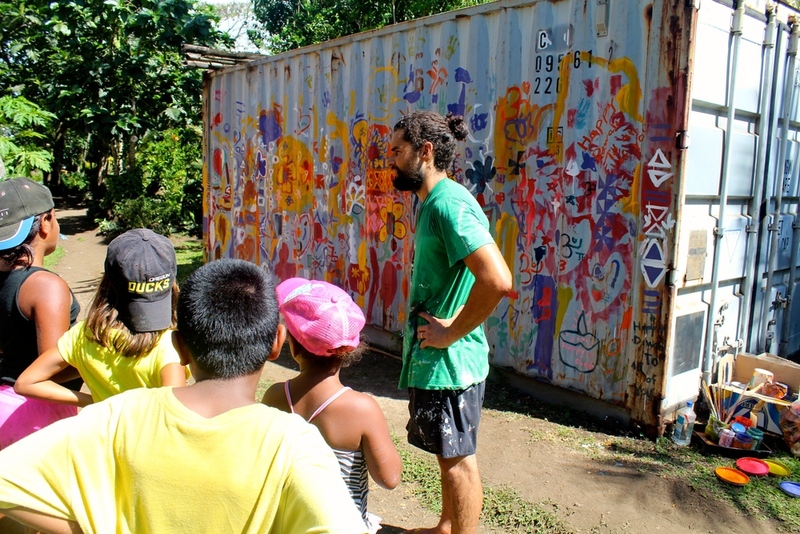 We had previously started painting another container at the resort and got a feel for how it would work. We showed the kids a few basic organic designs in the classroom, and we showed them how to use leaves as stencils, We also gave a quick lesson in color theory. We didn't have the best paints for the job, but we did have gloves and a very cooperative team of children so it was a relatively mess-free project. We mixed colors and cleaned brushes while they went to work. We gave the kids free range of the composition and color choices. The painting was limited to the areas the kids could reach, but they did a great job of filling those areas with bright designs! Taveuni is full of inspiration. In our free time, Jack has been picking up the guitar and ukelele and I've been working on watercolors. Here are a couple Taveuni-inspired watercolors. Today marks two weeks until we fly to Fiji. I have one more week of work left, and Jack will be working until July 19th- the day before we fly! I’m making lists and brainstorming on things we’ll need and I’ll be in full-on packing mode next week. This weekend we made many of our favorite dishes and spent time with family. Summertime markets in the Bay area bring a colorful, beautiful assortment of fruits and veggies, so we’re enjoying it all while we can. This weekend we had lots of fresh berries, apricots, peaches, plums, pluots, veggie skewers (mushrooms + pineapples +red onions + yellow, orange, green, and PURPLE bell peppers), coconut + mustard seed spicy cabbage, creamy red lentils, chickpea burgers, pea + potato curry, brown rice, cucumber salad, carrot salad, lettuce + kale + +tomato + sweet potato salad, roti, tamarind + date chutney, berry pie. Last week, my friend Brittany, asked me about pet portraits because she’d been looking around on Etsy and wanted a portrait of her adorable Westie, Fender. I love the concept and we’ve done many sketches and paintings of our pup, Zoey. We put our Etsy shop on vacation because we’re working on packing, storing and selling items locally as we prepare to head to Fiji. Pet portraits have been something we’d love to add to our East Rand repertoire. I’ve known Brittany since we were in first grade, and we were always creating together. She has always been an exceptional writer and story teller, so I thought it’d be great to portray her pup, Fender as a writer, with a typewriter and crumpled (in Fender’s case, half-eaten) paper. Brittany’s husband Andrew is a saxophone player, so I added a sax to Fender’s “office.” Brittany and Andrew have another dog, Cami who is a sweet and shy Shiba Inu, so I added her glamour shot to the wall. I’m excited to get the final product to them!